In this view, the central gather panel shows the gather at the intersection of the currently displayed inline and crossline. From the View menu in the Control Panel, select the IL/Gather/CL View. At the navigation bar of the view, select the time/depth parameter (TWT or TVDSS) and the IL/CL location to display. 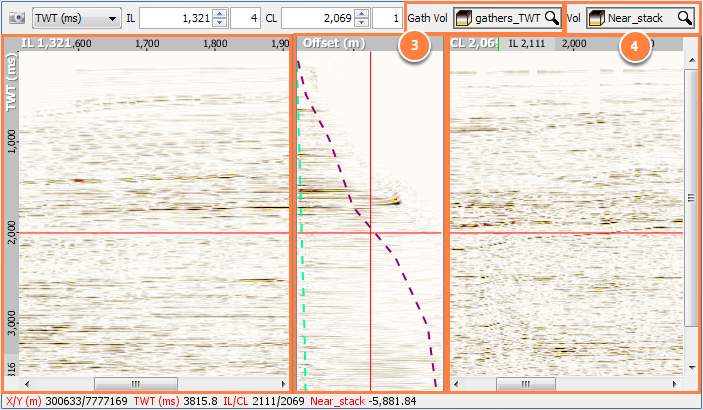 At Gath Vol, select the gather volume to display in the middle panel (red boxes in the image). At Vol, select the volume to view the trace at that location (blue boxes in the image). The navigation controls at the top of the window function similarly to other section views (see Navigation Bar in Views). To add a scale bar and a volume colourbar in the view, right click anywhere and select View Settings. To adjust the scale settings in the view, right click and select Scale Settings. If you select offset gathers in the IL/CL Vol selector AND the gather selector, Insight will display a single offset plane through the gathers. All of the display screens are linked, so you can also drag the IL/CL markers in the Map View to update the IL/Gather/CL View. Likewise, from the IL/Gather/CL View, you can adjust the selected depth marker and the Map View and 3D View will update automatically.